Mindfulness can be extended to many different parts of our lives; it is being present in what is happening to us at a given moment physically, mentally and emotionally. It allows us to pay attention to our surroundings without judgement, and to be aware of the moment that we are currently experiencing (1). This is where change begins. One example of using mindfulness in our everyday lives is through our food choices. Eating is a unique experience for each of us, as each of us has a different relationship with food. By understanding our own relationship with food, we can be more aware of what influences our eating behaviour. Awareness is the key. There is no right or wrong way to eat. There is no perfect diet. There is no one food that is going to save you from developing any specific condition. Often times our eating behaviour is influenced by food cues cravings, and emotions. For example, if we are used to always eating a few cookies while we watch TV, then we will always want to have cookies while we watch TV. It is not because we physically need them, it is because we associate the experience of watching TV with eating cookies. Sometimes we will eat to keep ourselves busy when we are bored, and not truly realize what or how much we are eating. We might go for more high calorie comfort foods and larger portions when we are stressed, as there is a connection between chronic stress and food cravings (2). Our eating behaviour can also change depending on our environment, such as whether we are eating on our own or with a group of people, as well as whether we are in private or in public. Another aspect of mindful eating is our own personal experience with eating food. When you are sitting down to a meal, are you in fact sitting down to a meal? A healthy relationship with food involves being aware of the taste, texture, aroma, and appearance of the food we eat. All of these things come together to form our overall eating experience. However, with all the distractions in life (smart phones, social media, TV, driving, music) it is all too easy to loose that connection with food. When we free ourselves of distractions, we allow ourselves to fully experience the joys of eating, and tune into when we are feeling satiated or satisfied. How we feel about ourselves and how we feel about food is very influential on what, how, when, and why we choose to eat. Just as we all interact with the world in our own unique way, so too do we all interact with food differently. Slow down – Make a point of putting down your fork between bites. Chew more slowly, and take time to fully experience what you are eating (colours, textures, scents, tastes, sounds. Look at the clock and time how long it takes you to eat your meal, then extend that time by 5 to 10 minutes. Avoid distractions – Turn off the TV, put down the phone, and try to not talk for at least half your meal. Start out by having at least 1 meal a day with zero distractions. Fullness – Pay special attention to your body, it will tell you when you are full and satisfied, then look at your plate. Many of us have been taught to finish what is on our plate, which makes it difficult to know when you are actually full. Keep a food diary – If you are curious about finding out what affects your eating habits, take a few days to note what you are eating, the proportions of what you are eating, how you are feeling at the moment, and where you are eating. Plan ahead – Make a grocery list before going to the store. If you bring more healthful foods into your home in the first place, you will be more likely to enjoy them more often. Stress management – Stress can negatively impact our health by changing our eating patterns(2), so develop strategies to manage stress in a healthy way. Do things that you enjoy, such as picking up an old hobby,or trying a new one. Yoga – Practising yoga may be associated with improved body awareness and mindfulness as it focuses on process as opposed to outcome (4). Next time you eat, take a moment to reflect. Become aware of the whole situation, and try to find connections between your own typical eating behaviour and what you are feeling. Think about if you want to eat because you are feeling hungry, or if you want to eat because of something else that is going on emotionally, socially, or habitually. Food is intended to heal and nurture our bodies. We can better understand its potential by becoming more aware of the implications of growing, preparing, and consuming our food. Using all of our senses to experience food allows us to choose foods that are both enjoyable and nourishing. This can be an opportunity to try something new, and acknowledge how your taste buds respond to it without judgement. And finally, teach yourself to understand when to begin and stop eating through your own personal awareness of physical hunger and satiety. Change is a journey, and each of us is a work in progress. The first step is awareness. Even though might seem like a very small step, keep in mind that goals are best achieved by being broken up into small, attainable, sustainable actions. Practising mindful eating can allow us to reflect on how we can develop a healthier relationship with food. (1) The principles of mindful eating. The Centre for Mindful Eating website. http://www.thecenterformindfuleating.org/tcme-principles accessed February 21, 2015. (2) Tyron, M. S., DeCant, R., Laugero, K. D. (2013). Having your cake and eating it too: a habit of comfort food may link chronic social stress exposure and acute stress-induced cortisol hyporesponsiveness. Physiology and Behaviour, 114:115 (32-37). (3) About the Am I Hungry? 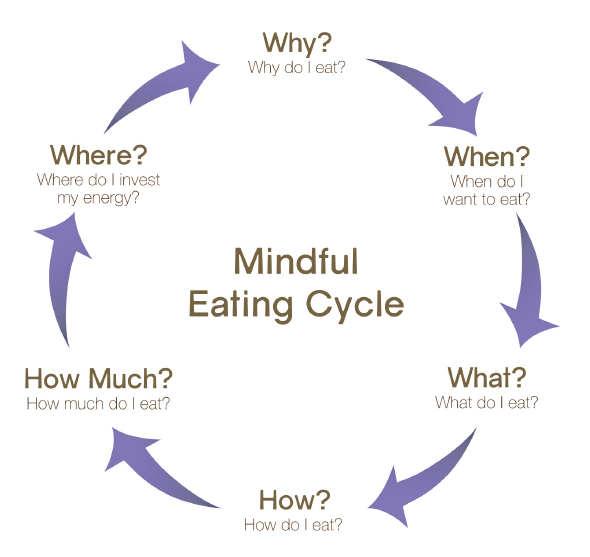 Mindful Eating Cycle. Am I Hungry? Website. http://amihungry.com/resources/about-the-mindful-eating-cycle/ accessed February 25, 2015. (4) Martin, R, Prichard, I., Hutchinson, A. D., Wilson, C. (2013). The role of body awareness and mindfulness in the relationship between exercise and eating behaviour. Journal of Sport & Exercise Phychology, 35, (665-660). (5) Harris, C. (2013). Mindful eating – studies show this concept can help clients lose weight and better manage chronic disease. Today's Dietitian website. http://www.todaysdietitian.com/newarchives/030413p42.shtml accessed February 23, 2015.